This remote archipelago of islands off the coast of Argentina is home to exotic penguins, rare birds, huge seal colonies and lots of sheep. 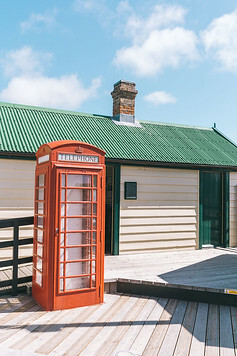 Officially a British Overseas Territory, this remote outpost is most often visited on cruise ships, where the Falklands serves a launch pad for adventure expeditions in Antarctica. Electricity: 240V – but why worry about this? Grab a universal plug adapter! The density of wildlife on the Falkland Islands is simply incredible. Even more amazing? Most of it is accessible! Penguins outnumber people by the hundreds of thousands and because they’re unused to human contact, many of them are curious enough to waddle up close. Whether you want to see King penguins, elephant seals or giant albatross, it’s all possible in the Falklands. Check out 9 incredible places for wildlife watching in our Falklands travel guide. The Falkland Islands are a natural jumping point to the Antarctic. In fact, they’ve been the final stop for preparations for exploring dating back to the 19th century. If you’re planning a trip down south to the Falklands, why not add on a detour to South Georgia? Both are British overseas territories and South Georgia is even more remote, with even larger colonies of penguins to watch. 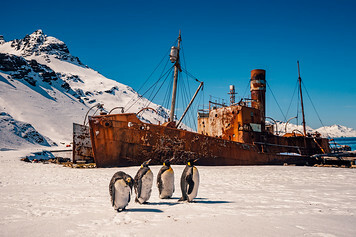 We explored the Falklands, South Georgia and Antarctica on an expedition cruise. 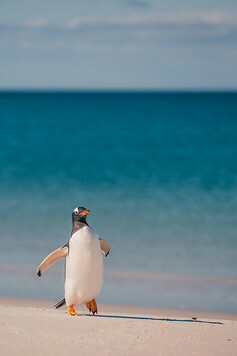 September: Gentoo and Magellanic penguins return to the Falkland Islands to begin building nests. Gentoos are some of the funniest penguins to watch. They’ll steal nest materials from their friends… without realizing they themselves are being stolen from! Elephant seals are also returning to shore and it’s a great time to watch male elephant seals fight for dominance. The winner of the season is crowned beach master, with the rights to breed with all the females in his harem. October: Gentoo and Magellanic penguins begin to lay their eggs. Black browed albatross and Rockhopper penguins begin to return for their egg laying season as well. If you’re lucky, you’ll also see young elephant seals being born and suckled. They start off small and black, and gradually grow more silver. November: Penguins begin to incubate their eggs. King penguins, however, are unique. They have a much longer chick rearing cycle and you’ll spot lots of large, furry brown King penguin chicks from last year begin to molt and start the return to sea. December: Penguins and Albatross eggs begin to hatch. Most of the adult elephant seals depart for the sea, leaving their pups on shore. Meanwhile, bull sea lions begin to arrive and establish their territories. January Gentoo and Rockhopper penguins begin to form a crèche, while albatross birds guard their fluffy chicks. It’s also a great time to spot sea lion pups! February Young Magellanic penguins begin to explore outside the burrow while sea lion pups also start to gain their independence, forming young groups. March It’s late the in season now and everyone, from penguin chicks to sea lion pups, start to depart for the sea. If you’re visiting the Falklands via cruise, no visa is required. However, if you’re flying in to stay on the island, you will need proof of onward travel as well as a visa. Carry British pounds and/or credit cards to use for incidentals on the island. Sturdy walking shoes and warm layers are a must as well. On sunny days, it can be quite warm, but on cold days you’ll want to pile on all your warm clothes! 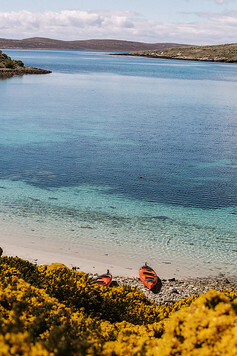 The Falklands are a popular cruise destination in the summer season, from October to March. This was how we visited the island, and it was nice to have everything (accommodation, food and transportation) all taken care of! Alternatively, you can fly but flight routes are limited. From the UK, the Royal Air Force schedules charters by way of Ascension Island. From South America, LATAM operates flights once a week on Saturdays from Santiago, Chile, to Mount Pleasant Airport, East Falklands. It’s then about a one hour drive to Stanley from the airport. Soon, LATAM will schedule a third flight option from Sao Paolo, Brazil, stopping at Cordoba. As the Falklands are remote, it can be slightly difficult to get around if you’re exploring on your own. Again, the easiest and most convenient option is to tour via cruise. But you can also hire a 4 wheel drive, or try the local air service, Falkland Islands Government Air Service (FIGAS). These small planes broadcast their daily schedule and passenger list via radio the night before and fly low enough that you can get a bit of a scenic aerial tour as a bonus! In 2019, the Falklands hopes to launch helicopter services as well. We explored both the Falklands and South Georgia on a cruise with Poseidon Expeditions. Expedition cruising is unique – landings depend on wind and wave levels so every trip is different! On our voyage, we had the opportunity to land at beautiful, remote sites on both East and West Falkland and see penguins, seals and bird life up close! Insurance | You don’t want to risk injury in one of the most remote places of the world! 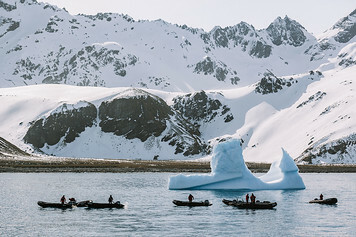 Airlifts to a hospital from the Antarctic can cost a fortune, so it is mandatory to purchase travel insurance of least $200,000 for expedition cruising. Luckily, we didn’t have any incidents but better to be safe than sorry! I use and recommend Allianz travel insurance. Port Stanley, a classically British outpost at the end of the world. Our cruise to the Falklands!